As much as they still do today, past empires staked out their claims on territory with walls. Religions too used walls to delineate and isolate places of heightened meaning. As such, walls are at once part of political and religious systems, but they are also highly concrete artefacts. 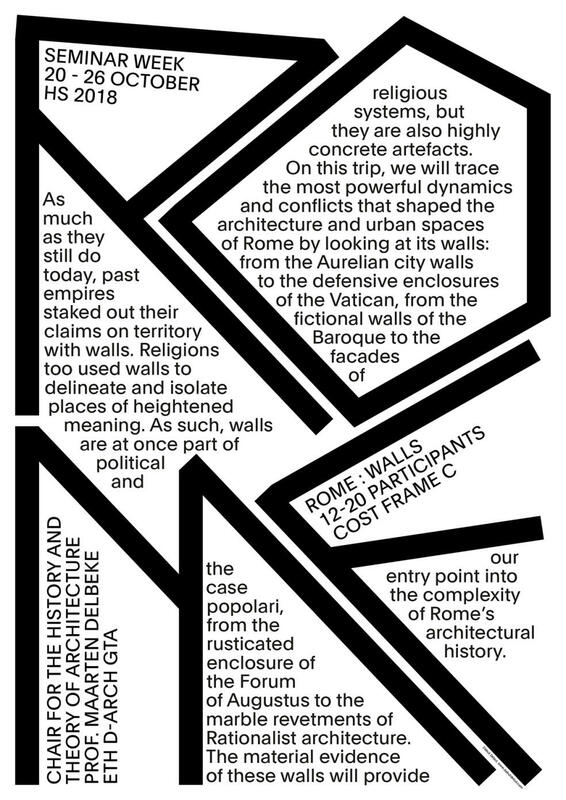 On this trip, we will trace the most powerful dynamics and conflicts that shaped the architecture and urban spaces of Rome by looking at its walls: from the Aurelian city walls to the defensive enclosures of the Vatican, from the fictional walls of the Baroque to the facades of the case popolari, from the rusticated enclosure of the Forum of Augustus to the marble revetments of Rationalist architecture. The material evidence of these walls will provide our entry point into the complexity of Rome’s architectural history. Cost frame C incl. flight, accomodation in double or triple room, transfers in Rome, public transport, entrance fees and taxes.